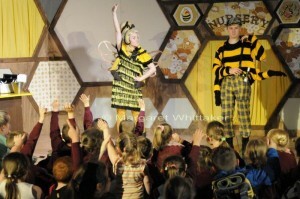 The buzz around the hive is that Elinor Keber made a very excellent debut as Sophie Bee at the beautiful Alnwick Garden. Here she is in action. Check out our facebook page for more pics. Yeehaa! London Unlimited Festival here we come! Bee ready! A big thank you to Alnwick Gardens for bringing us such amazing audiences. The actors had brilliant fun and enjoyed the interaction with children. Sophie Bee (Elinor Keber) said: “In the third show this afternoon, two small boys shouted “you’re rubbish” at me quite relentlessly (they wanted the boy bee to win). I’m trying not to take it as a slur against my acting”.